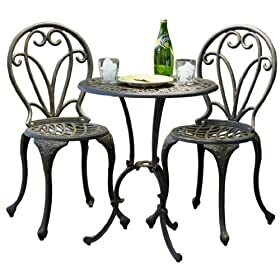 The Windsor Dark Gold Cast Aluminum Bistro Set creates a scene of charming elegance. The artistic curves of the chairs and table will melt away stress and take your mind to a calmer place. Perfect for a morning coffee or just an intimate evening dessert on a cool summer's night. This set wasn't designed just for looks though, as your back will enjoy the surprisingly comfortable seating as much as your eyes will long to follow the curves winding across the chairs and table. Both chairs and the table are made of strong, long-lasting aluminum, so your new favorite place to relax will remain so for many years to come. Rubber feet prevent disturbing noises when being moved, and also protect the surface below and the pieces themselves.